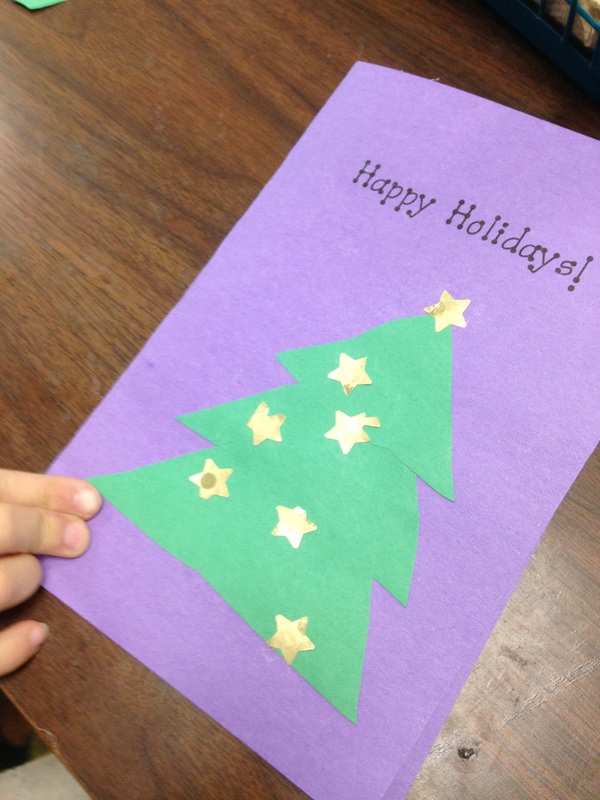 Christmas Card Project | Mrs. Anton's Class! We have had a great time taking part in the Holiday Card Exchange this year! I signed our class up to take part in a Global Christmas Card exchange this year! This card exchange is coordinated by Jennifer Wagner. Over 1000 teachers worldwide took part this year! We were responsible for sending out 32 cards to different schools in the world. Each of the schools in our group was responsible for sending us a card back! The theme for the cards this year was Lights. We sent off our cards in the early part of December and started receiving cards during the last week of school before the holiday break. We received the rest of the cards after Christmas. 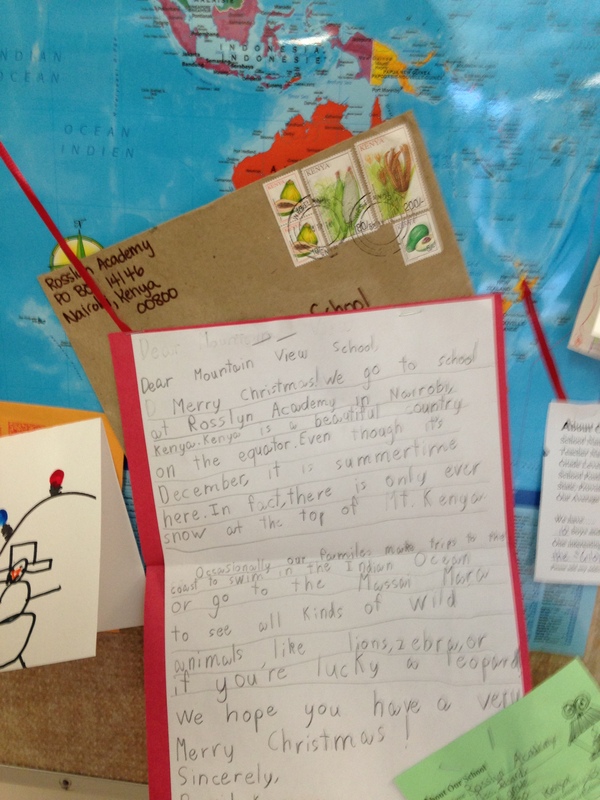 We sent cards to faraway places like New Zealand, Japan, and Kenya! We sent cards to other parts of Canada such as Newfoundland and Ontario. We sent many cards to schools all over the United States. And we got some wonderful cards back. 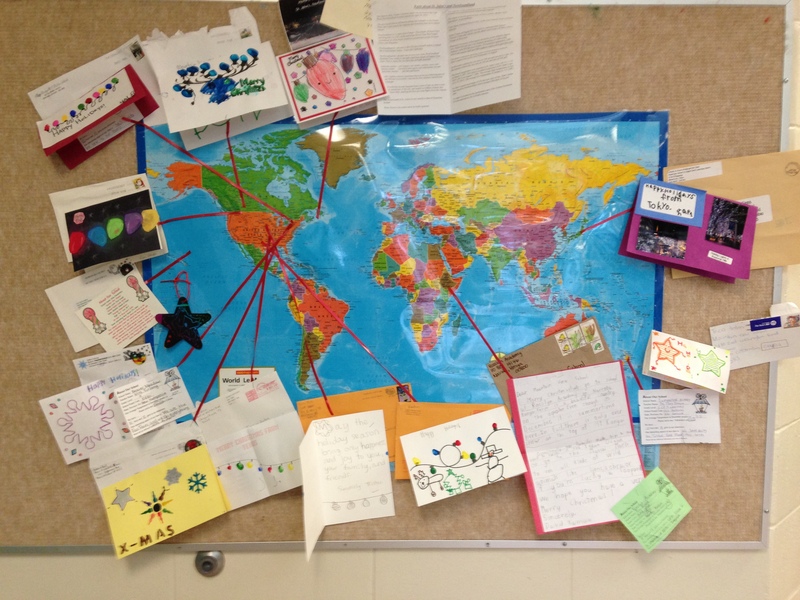 Some of the cards had pictures of the classes, or letters from the student who made the card. 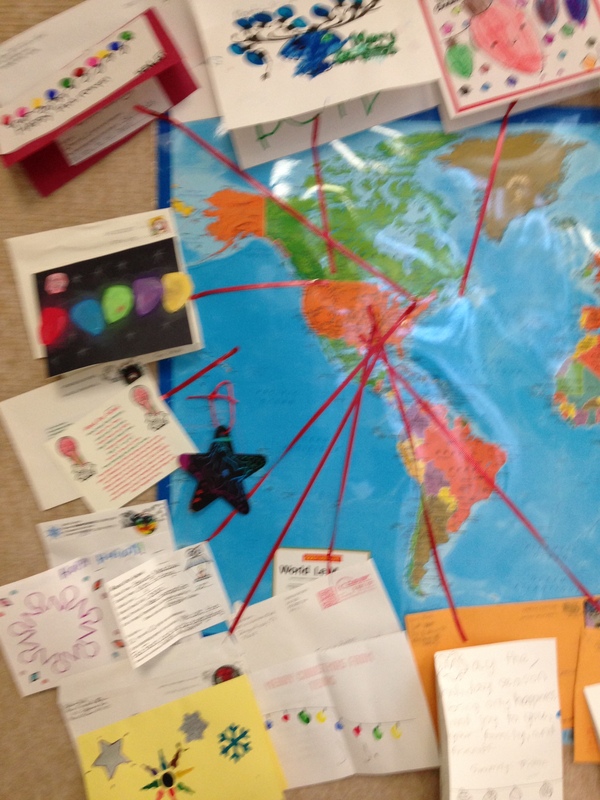 I bought a map of the world and we displayed our mail and where it came from! You can see our mail on the display board outside of the gym. 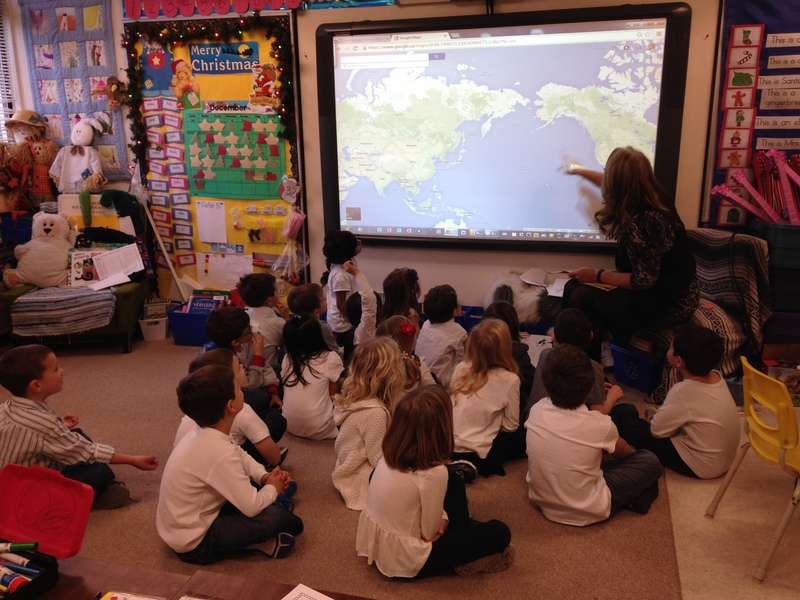 We also used Google Maps on our Promethean Board to figure out where each of our cards came from and how far away the school was from us! Using the Promethean board was awesome because I could zero in on a location of a swipe of my fingers. Very cool. As part of the project we had to include an information page about our school. We had to include what the average temperature would be in December, how many boys and girls were in our classes, and what we liked about our school. We found out some very interesting things. The fact that the children were most interested in was how many boys or girls were in the classes! 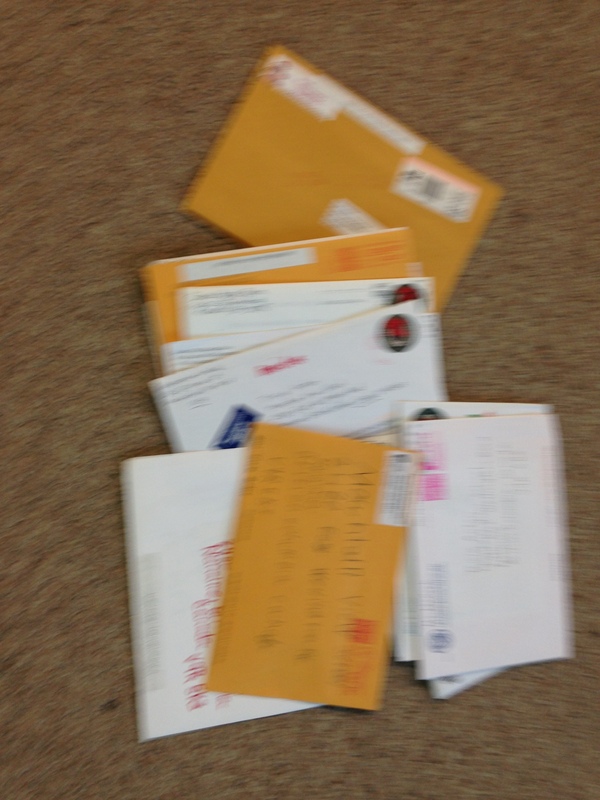 This picture show some of our mail on one day! Very exciting to get mail just for us! The stamps were very pretty too! This is a closeup of the letter from Nairobi, Kenya. We learned a lot from this letter. 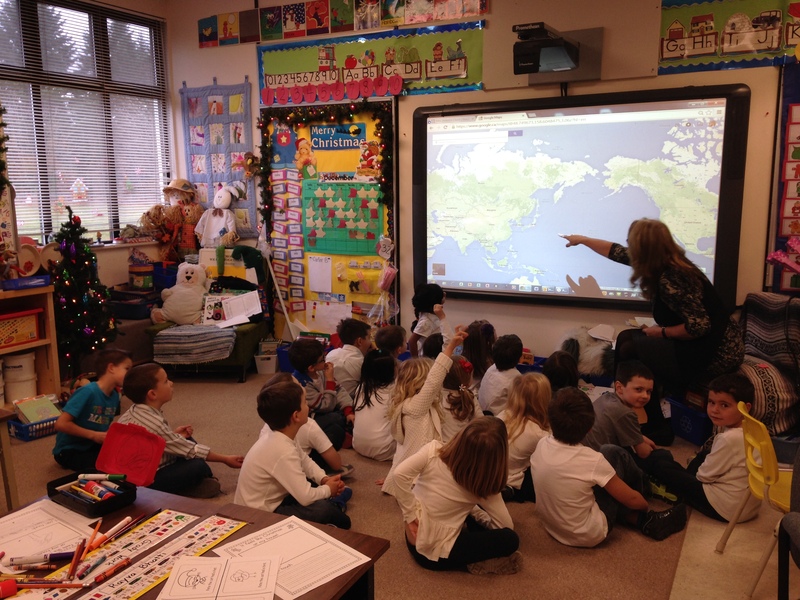 We learned a lot about different schools around the world and how big the world is! We also learned how much fun it is to get mail! I think we are all a little sad that this project is done. We liked getting Christmas cards! 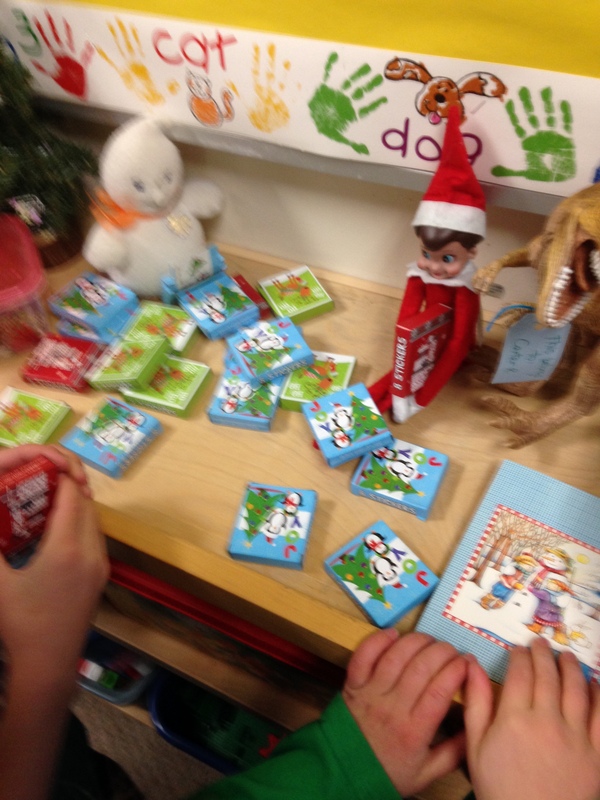 We hope they liked our cards too! 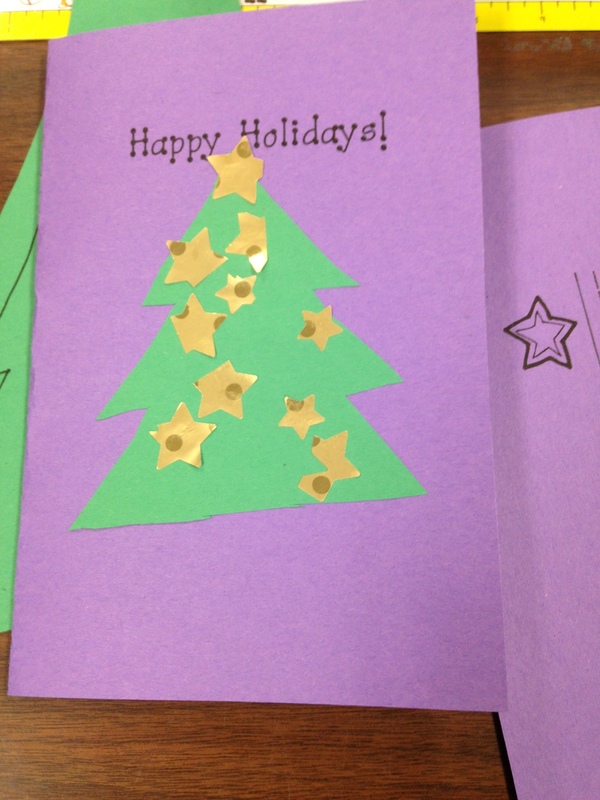 We have been having a great time making Christmas cards to send to 30 other classrooms from around the world. 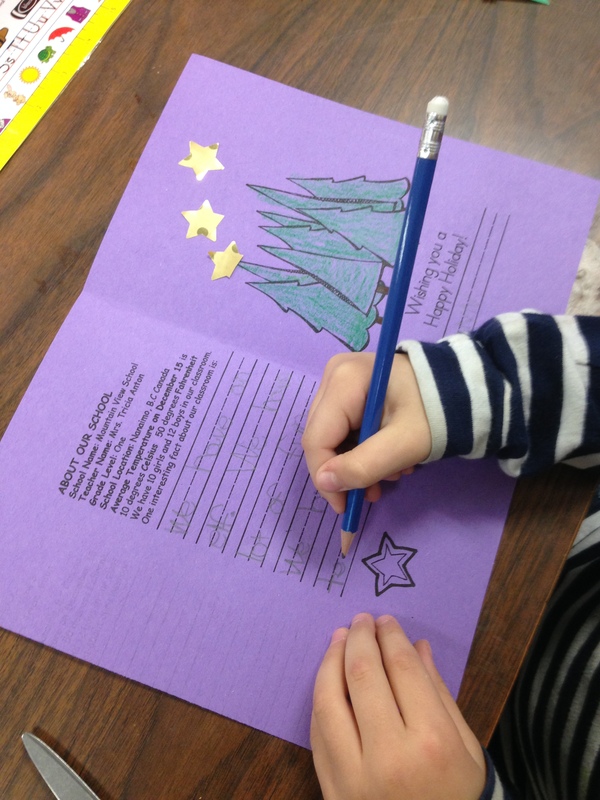 We are taking part in the Holiday Card Exchange with over 1,100 other classes in the world. This project is organized by a lovely lady in California named Jennifer Wagner. We have to make 30 cards and send them to the 30 names on our list. We will be receiving cards back from all the names on our list! We took part in this project last year and it was very exciting. This year we have cards going to Kenya, New Zealand, and Japan. 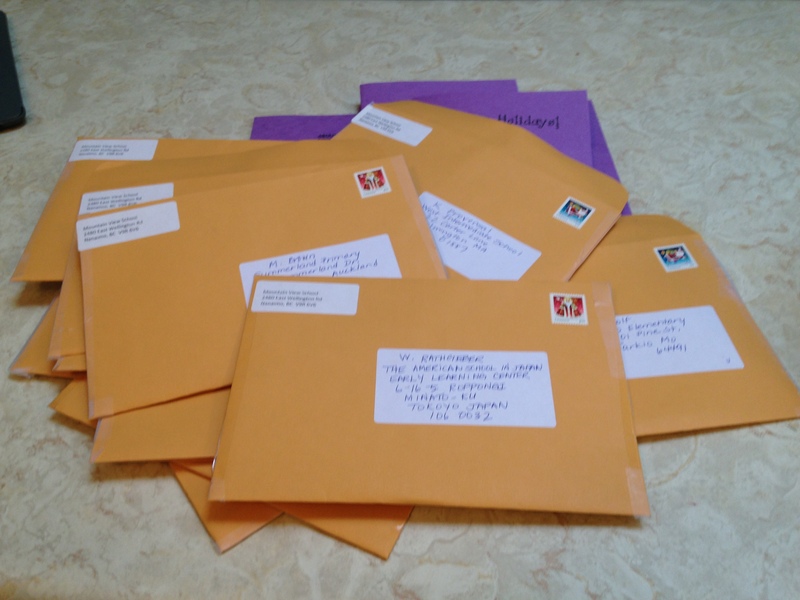 We have cards going to five places in Canada, and lots of cards going to a large variety of places in the United States! 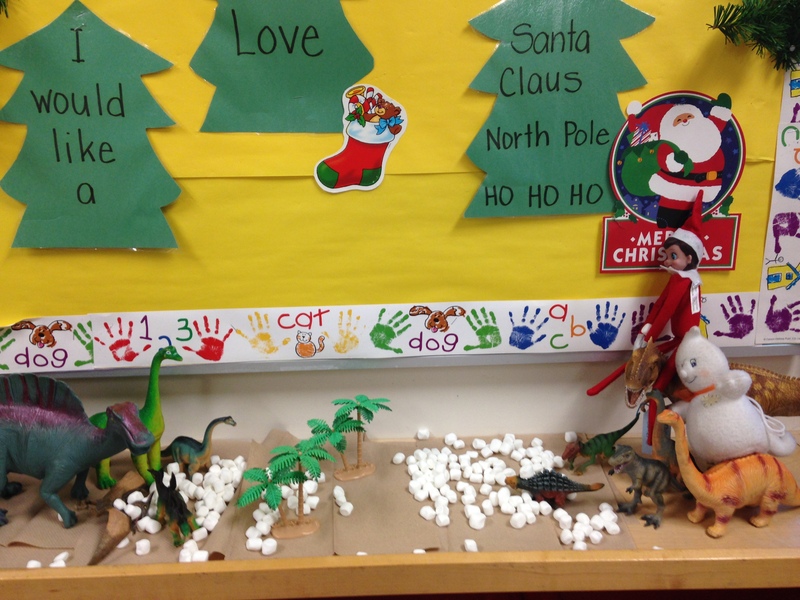 Sparkles, our Elf on the Shelf is back this year and started her visit with a snowball fight with the dinosaurs in the classroom. The snowballs were miniature marshmallows! Of course,we had to eat up the marshmallows to prevent further fights. 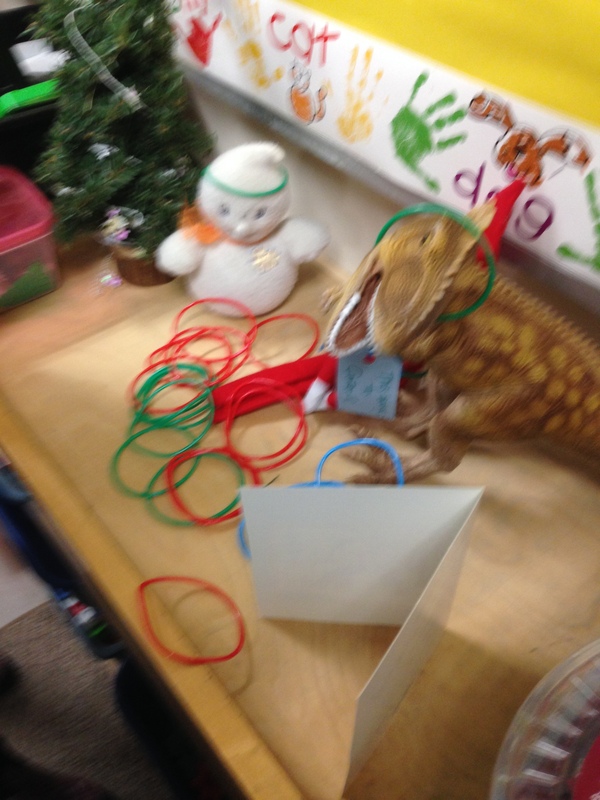 She has been leaving treats for the children each day! Sinterclaas paid a visit too! We are starting a new type of Brown Bag sharing over the next few weeks. We will be sharing our favorite Christmas customs. My family celebrates Sinterclass. I brought my wooden shoes to school and taught the children a few words in Dutch. That was enough to have our classroom become honorary Dutch citizens for the day and Sinterclaas paid a surprise visit! 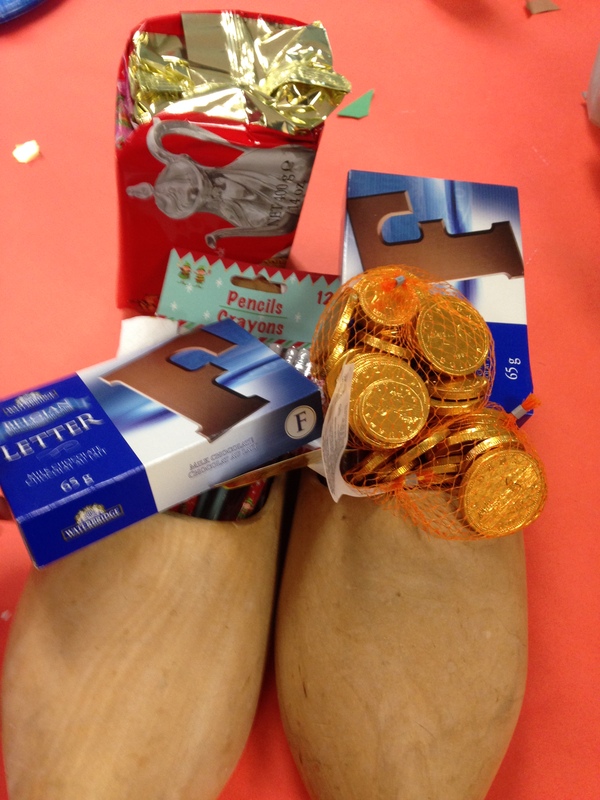 He left some Dutch gingerbread, chocolate coins, pencils, and chocolate letters. Very yummy!